One of the common assertions used to discard the classical tripartite study of philosophy is ‘Stoic Ethics are not founded on their Physics.’ This assertion, often phrased as a demand for proof that the Ethics do follow from the Physics. It’s very easy to ask a hard question, and it’s not as easy to answer it. Many new Stoics find themselves floundering at this question, and in the inability to argue well, the case is lost. So let’s look at the question: Are Stoic Ethics predicated on Stoic Physics? All human fields of study are built on axioms. Axioms are unproven assertions that are taken for granted. In mathematics, one such assertion is that 1+1=2. Everything else is built on this, now while there are some who claim to prove that 1+1=2, the average person, the average university student even, cannot prove this (especially if you find “succession” and “recursion” arguments unconvincing). It’s an axiom, for most. You might wonder why I bring up these axioms, and that’s precisely to prove the point that at some point, some unproven thing must be accepted. Else: we’re forced to acknowledge that the Pyrrhonians are correct, (but I bet they still drive with their eyes open). Understand: such assumptions exist. We’ll come back to this later. Now, Physics as the classical Stoics understood it, was the study of nature (Gr: φύσις). Their assumption was that without understanding the cosmos as it is, how can we begin to understand our right place in it? For them, this included the natural process of the universe, human psychology, and all other things relevant. It’s a solid question, one which prompted the scientific inquiry (which may have become a preoccupation or end-in-and-of-itself, since) of the past five hundred years. Now, the Epicureans argued that the infants’ crying out for food, warmth, and comfort is pleasure seeking behavior. It was this, they argued, that showed the basic impetus for action is seeking of pleasure, and avoidance of pain. The Stoics disagreed, they argued that the infants’ crying out for those things were indicative of an instinct for self-preservation. You might think that’s splitting hairs a little finely, since these things are both pleasurable and life sustaining, but it is not. For instance, let us look at exercise of the body. Many people will say the enjoy it, but this is after the body is well accustomed to it. Take your average couch potato and begin him on a running or weight training regimen. This will very likely extend his life in the long run, it’s healthy. But is it pleasant? Most assuredly not. In fact, the body is broken down, injured, exhausted. Health decreases on the short term during this adaptation phase. Here we can clearly see there is a difference between what’s preserving behavior and what’s pleasurable behavior. The Epicurean then, is stuck seeing pleasure later in life, while the Stoic is then concerned with preservation of things valuable (which will reasonably extend beyond the self, shortly). So, this natural instinct for self-preservation, this affinity for one’s own self is an interesting trait. The classical Stoics thought so, too. In more advanced critters, like humans, we see this affinity for one’s self extended to others. Many animals show it, however, as an affinity for family members. Some extend it towards their whole species. Humans, as rational and socials critters, can extend it beyond all the others not just to our species, but indeed to all rational creatures. This is called Oikeiôsis (Gr: οἰκείωσις). This expansion of self-interest is the motivation for rushing into a burning building to save children, or the stranger who reaches out and pulls a pedestrian out of the car’s path. For Stoics, it’s not a just a mere description, but a mandate for individual action and judgments. Oikeiosis and the domains of affinity. The process of this affinity is to “make things like family.” We start by treating our fellow townsfolk as family, our fellow citizens in the state as neighbors, and foreigners as our countrymen. We can even extend this in the future to other rational creature and treat them like siblings in the Logos. Effectively, we’re extending each circle by one. 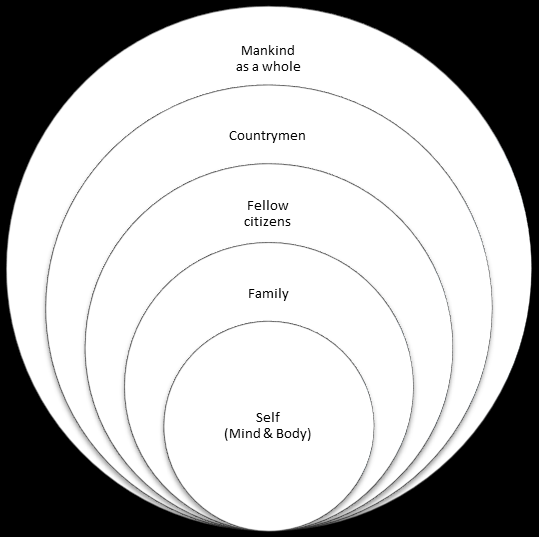 So family is treated as self, citizens, like family, etc., per the image to the right. Oikeiôsis is a key Stoic ethical doctrine, and it is founded on the study of nature, on their physics. How so? Only by watching animals become aware as they are of themselves, and taking care of this possession of their lives as a natural function. Then we see the social animals, even going so far as to sacrifice their lives for their societies, and to us, as rational and social animals as shown. This Ethical maxim, this injunction to make others “like family” is based on their observation of the universe and the things and creatures in it. One might argue “Yes, but this principle doesn’t have to be founded on physics.” This is an unconvincing argument, because they were. While it’s true, that such a ‘good behavior’ might be a mere social construct, when we are doing historical analysis, it behooves us to take into consideration what the folks themselves said they believed. We might disagree with the conclusions, but it still needs to feature into the discussion; which (some-but-not-all) folks who want to discard Stoic physics seem reluctant to do. Additionally, to digress slightly on the question of social constructs, just because a thing is a social construct doesn’t necessarily devalue it, or make it unimportant. I’m not sure why this has become a catch argument these days, it’s not a reasonable objection. Not wantonly killing innocents might just be a social construct, but it’s a good one. So, do we need to believe in a two-thousand year old understanding of nature to be good people? Nope, not in the slightest. But if we want to understand a school of thought, even if we set it aside in favor of something else, we do need to understand appreciate what brought it about. And when we’re talking about Stoic Ethics, that means an investigation into Stoic Physics. Just as the axioms previously discussed, the foundation of Stoic Ethics in particular should be accepted as founded on their Physics. Can you divorce Stoic Ethics from Stoic Physics? Yes of course. But should you? Ah… that’s the question. I would offer, no, you should not. For more on the applicability of Stoic Physics to the modern understanding of the universe, please see this entry: In defense of the conscious and providential universe. Great post Kevin. I’m looking forward to more in the future.